This blog consists of descriptions of my various vintage cameras and my experiences in using them. I welcome your comments and additional information. I am also happy for people to write their own reviews of their old cameras for inclusion in this blog. Other pages in my blog. This is a very nice folding camera from 1930s Germany. It is one of the first cameras to use Kodak's 35 film cassette - this was made soon after Leitz made the Leica (1925) and Zeiss Ikon the Contax (1932). It follows Kodak's lead in producing a folding camera unlike Leitz and Zeiss Ikon who both made rigid 35mm cameras. The camera is fairly small - it measures 120mm x 82mm x 35mm when closed and 120mm x 82mm x 85mm when open. It is almost exactly the same size as Voigtlander's later Vito and Vito II cameras but a bit heavier. The covering seems to be leather rather than leatherette. This is my second Balda camera - the other being a Baldessa from 1965. This camera had been stored somewhere not particularly dry before I bought it and the finish showed the results. The leather was very dry and dull, much of the nickel-plated steel has rusted and the moving parts were all very stiff. I attacked the leather with Bestbeloved's leather restorer and it is now a bit more subtle and has a nice sheen. Moving parts have had a drop of oil/naphtha mix (I mix 2 parts clock oil with one part naphtha to produce a freely running oil. This flows into hinges and axles easily - and when the naphtha evaporates the part is left with a very small amount of oil) and now move easily. I have yet to deal with the rust but will do so when I have finished the test film. I shall rub down just the rust and then treat it with Loctite Rust Remedy. This leaves a durable black finish which I shall leave as-is. The last thing to note, condition wise, is the presence of 'Zeiss Bumps'. Zeiss Ikon cameras are notorious for these and this is the first time I have seen them on a non-Zeiss Ikon camera. they are caused by the manufacturer using a different material for rivets than he used for the body. A chemical reaction will then be set up in the presence of damp resulting in the build-up of corrosion products between the metal of the body and the leather covering. These 'Zeiss Bumps' occur on the lens door and in the leather by the take-up spool. Zeiss Ikon and Voigtlander used die-cast aluminium for their camera bodies which made for strength and lightness with the added advantage that they were corrosion resistant. This camera seems to be made from steel. The outside is a mixture of leather and nickel plating and where the nickel has worn, the camera is rather rusty. My Zeiss Ikon Nettars from the same decade were leatherette and paint and where the paint has worn you can see the aluminium. Balda's use of steel and nickel plating would have made the camera cheaper to make. I assume that this also meant that the camera was cheaper to buy but it would not have been cheap. With a Compur shutter, it would have been aimed at a serious amateur photographer. The camera is quite well appointed. It has a 'proper' viewfinder rather than the metal frames that Zeiss Ikon's Nettars and Ikontas had. This is small (as was usual even on expensive cameras) and is a reverse Galilean finder (that means it is like a telescope backwards as it makes things small). This viewfinder has a remarkable addition - a parallax adjuster. When you have set the focus on the lens, you put the same distance setting on the viewfinder and the viewfinder moves up or down accordingly. For infinity, the viewfinder is fully up and as you dial in nearer distances, the viewfinder lowers itself. Apart from this camera, I have only ever seen this on expensive rangefinder cameras. On the top plate along with the viewfinder is the film rewind key and the frame counter. This last is beneath a hinged cover and counts from zero to 36. This is a count-up counter, the user setting the counter to zero when loading a film into the camera. Beside the viewfinder is a small button. Pressing this will release the hinged lens cover and the lens will spring forward automatically - it does so with a reassuring 'snap'. 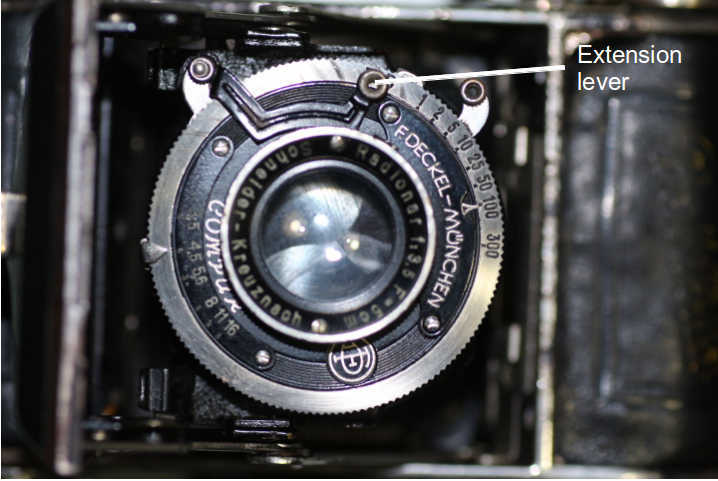 The shutter leaves are between the lens elements so focusing is only front-cell focusing (i.e. only the front piece of glass moves when focusing, not the whole lens. This causes a slight degradation of the image with close-up work. For landscapes it makes not a jot of difference). The film advance is on the bottom of this camera - possibly to circumvent other manufacturer's patents, certainly not because it makes it easier to use. Advancing the film is not as straightforward as turning the knob (no lever advances at this early date). Leitz, Kodak and Zeiss Ikon had 35 mm cameras on the market when this camera was designed and each had patented every aspect of camera design they could. They also pursued patent infringement vigorously. The outcome of this is that manufacturers trying to bring new models to market had to find workarounds to avoid being sued. In this case, the film advance is locked until you press a button on the base of the camera. This must be released as soon as you start turning the film advance knob or you will advance more than one frame. To make this as hard as possible, you first have to push in the safety lever, then press the small button and then turn the advance knob. Also on the bottom of the camera is a tripod boss. This is the original 3/8 Whitworth thread rather than the more modern 1/4 Whitworth. This is to one end of the camera - it seems to have taken camera manufacturers a long time to work out the point of balance of a camera. Inside is pretty much as you would expect even from a modern 35 mm camera - a sign that this layout was well designed from the start and not patented. The hinged back has effective light baffles and so there is no need for foam light seals - nothing to go gooey and messy with age and nothing to start leaking light. In the centre of the back is the pressure plate to keep the film flat against the film gate. To one end is a nickel-plated spring to keep the film in place on the sprockets. Loading film is easy. There is a spring on the take-up spool under which the end of the film goes. No particular shape of film leader is required but the modern standard leader works fine. When open, the door hinges on the left, leaving plenty of room for the right hand to have a firm hold. Many folding cameras hinge on the right leaving a restricted space for gripping. Voigtlander's Perkeo and Vito cameras hinge on the right. When holding the camera for use, the shutter cocking lever must be moved upwards (this is a Compur shutter, a Gauthier shutter (Prontor) would need the lever moving downwards). The shutter release provided by Compur is hidden by the folding struts and cannot be reached. To overcome this, Balda have added an angled extension which can be reached by the middle finger of the right hand. There is also a socket for a standard cable release. Adjusting the shutter speed is easy - this is a rim-set shutter and you turn the outer ring until the required speed is aligned with the index mark. Altering the aperture is not so easy. The control is close to the door and between the folding struts. This is quite do-able but requires looking at the camera from the front. I have finished the test film which raised a couple of things. Firstly, firing the shutter. The extension lever that Balda have added to the Compur shutter release travels a long way before it fires the shutter. I found this rather awkward and difficult to hold the camera steady while doing so. Secondly, rewinding the film. I have no instruction book for this camera and I have to work things out for myself. I assumed that the button that released the film advance mechanism would also release the rewind mechanism. Wrong! My attempt to rewind the film resulted in me pulling all the film out of the cassette. This meant a trip to Snappy Snaps to ask them to remove the film in their darkroom which they did. I now know that to rewind the film you have to lift the film advance knob and leave that other button alone. Oh well - this is all a part of the fun of collecting old cameras. Tomorrow, I shall collect the developed film and post a selection here. OK. The test film is back - and none the worse for me trying to rewind it the wrong way - kudos to the staff at Snappy Snaps. I am impressed with this camera. It was made in 1935 (plus or minus a month or two) and has worked flawlessly. The lens shows no sign of having been coated, which would have been very unusual in 1935, but is not particularly susceptible to flare. There is some flare visible in some of the pictures, but I have a habit of shooting into the light which would have been virtually unheard of in 1935 for the very reason that is causes flare. The lens focuses well and produces high contrast colour pictures. The lens will have been colour-corrected to some extent as that is necessary for using panchromatic black-and-white film and the lens clearly has no problems with modern colour films. There are marks on some of the negatives - basically, there are scratches which show up on the prints as black marks. I am putting this down to the damage caused when I attempted to rewind the film. It only affects a few of the negatives, most of them being fine. Shooting to the south on a sunny day (that is, into the sun), hence the flare. Shooting to the south again, but on a dull day - a small amount of flare. Shooting to the north on a misty day. No flare but some mist visible in the upper parts of the picture. Shooting to the south on a sunny morning - no flare as such. Shooting to the east on a sunny day. Shooting in a heavily shaded alley - good contrast and colours. If you have enjoyed or learned from John's Old Cameras, please make a small donation. This helps me to buy and repair more old cameras and to share what I discover with you and the world. Just one Euro, Dollar, Pound will make a big difference to the number of cameras I can include here. Taking the stop out of printing? (C) John Margetts, 2010, 2011, 2012, 2013, 2014, 2015, 2016. Simple theme. Powered by Blogger.